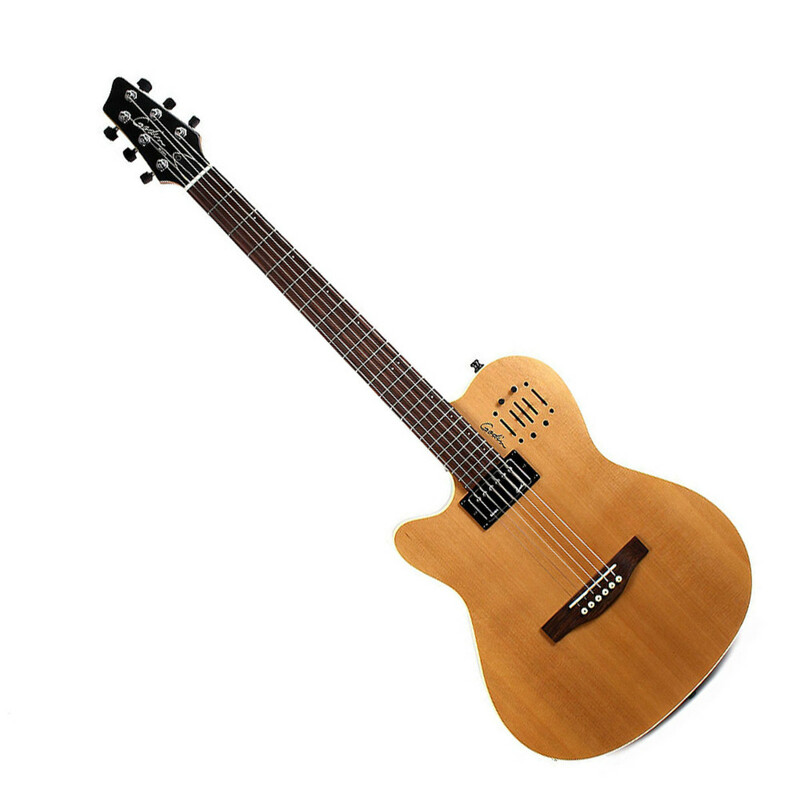 The Godin A6 Ultra Left Handed Guitar is the perfect electro acoustic for lovers of the electric guitar. The A6 has an electric feel neck, chambered body for reduced feedback when playing live and loud, a Godin humbucker at the neck and dual electric and acoustic outputs. The Godin A6 Ultra Left Handed Guitar combines plugged in acoustic sound with the feel of an electric neck, plus a chambered body design virtually eliminates feedback in live and loud settings. The A6 has the added attitude of a Godin humbucker at the neck with an under-saddle transducer, dual outputs (acoustic and electric) that can be combined for a huge sound and a Custom Godin preamp section voiced specifically for the A6 Ultra. The preamp allows you to control your tone via sliders for acoustic volume, treble, mid, bass and independent controls for the electric humbucker volume, treble and bass. Whether plugging into the single acoustic mix or via both outputs, controlling your tone is at the tip of your fingers. The A6 Ultra delivers in all styles of music from jazz to rock, country to blues slide guitar. Electronics: Custom preamp with Volume, Mid, Treble and Bass controls as well as independent volume, treble and bass controls for the Humbucker.